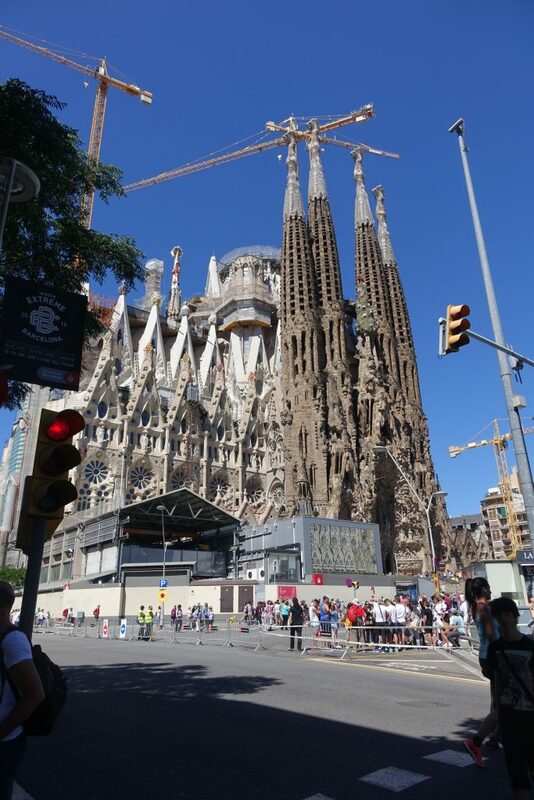 I was up pretty early on Sunday, as I’d pre-booked tickets to what’s probably Barcelona’s biggest attraction. I left the hotel at about 8.30am, and hopped on the metro. Coming up from underground, I turned around and there it was…. 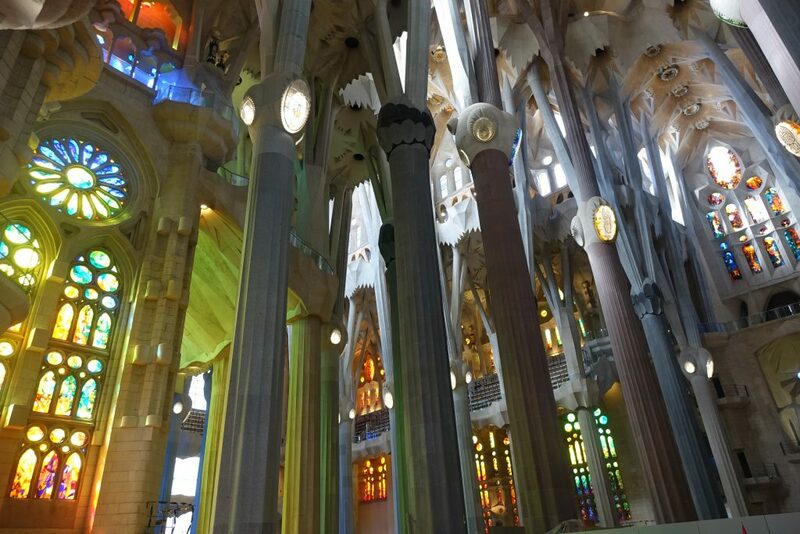 I was going to spend today exploring a bit more of Antoni Gaudí’s work, starting with Sagrada Familia – an enormous church. 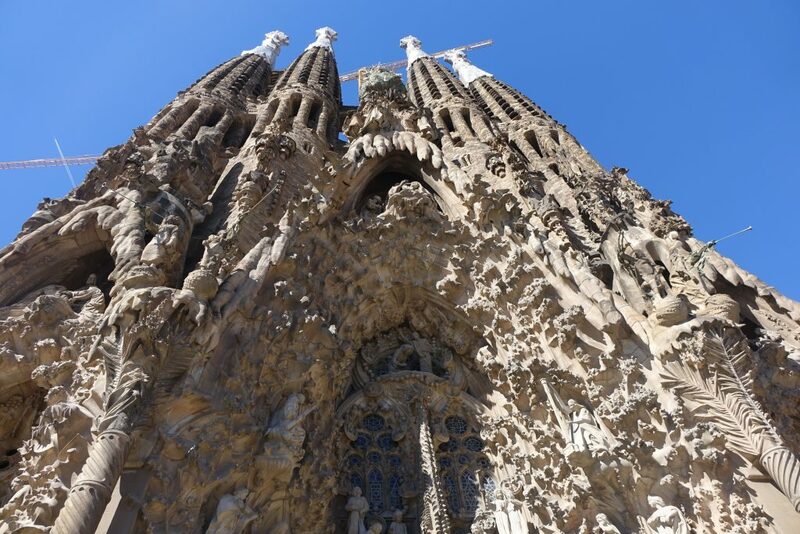 The first stone was laid in 1882, and 134 years later, it’s still not finished. 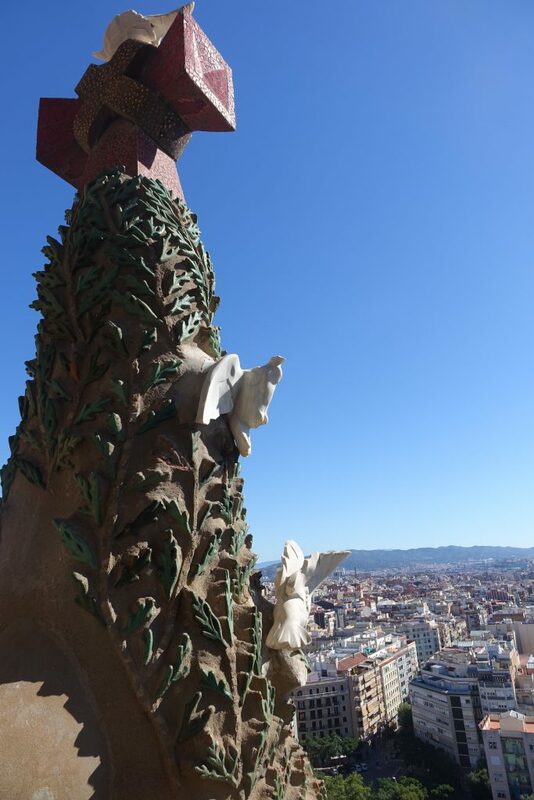 Current plans will see it completed by 2026 – the 90th anniversary of Gaudí’s death. After a quick spot of breakfast nearby, it was time to head inside. You buy your ticket ’round one side of the building (on Carrer de Sardinia), then the entrance is around the other side (on Carrer de la Marina). 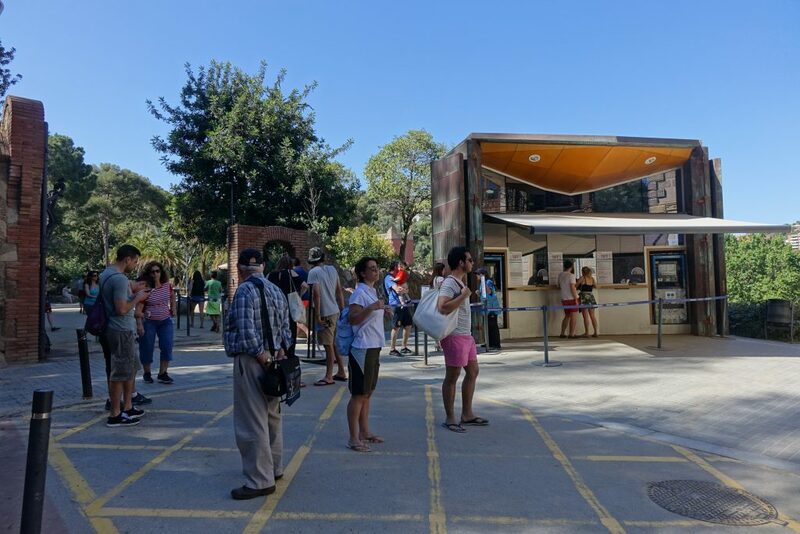 I’d bought my ticket online, and I’d definitely recommend that – you just head straight to the entrance, so only have to queue once (and then not for long). My ticket cost €29, and you just select an arrival time, and a time to go up one of the towers too if you want to do that. It was pretty busy with tourists already! I picked up my audio guide, and headed inside. I’d booked a slot for going up the tower on the Nativity facade for 15 minutes after I arrived, and the guy handing me my audio guide said that was a pretty smart thing to do 😉 Apparently going up the towers before exploring the church is a good idea. Pretty soon I was being whisked 50 metres up the tower in the lift, before climbing the last five metres. I didn’t think that sounded that high, but on walking out on to a small bridge, I saw I was wrong. It was a beautifully sunny day after the downpours of the day before, and you could see for miles. 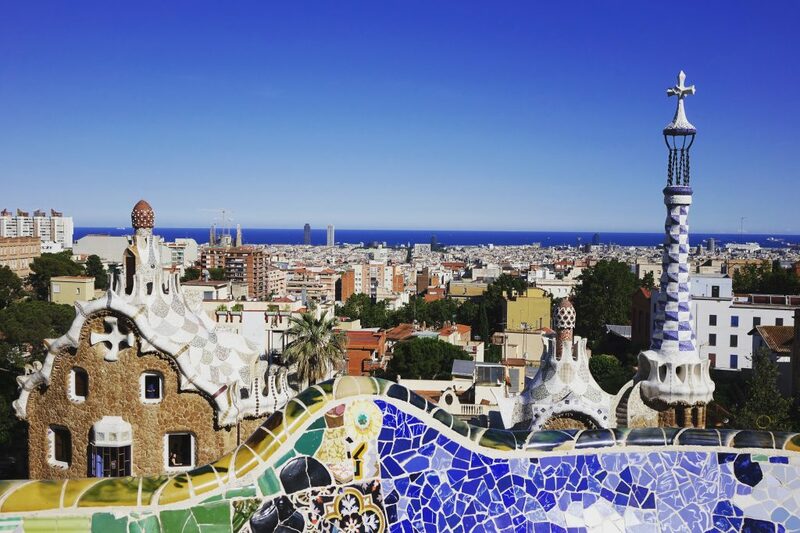 It was an impressive view – Barcelona was looking good! The ‘bridge’ we were on between two towers was pretty narrow, just wide enough for one or two people really. 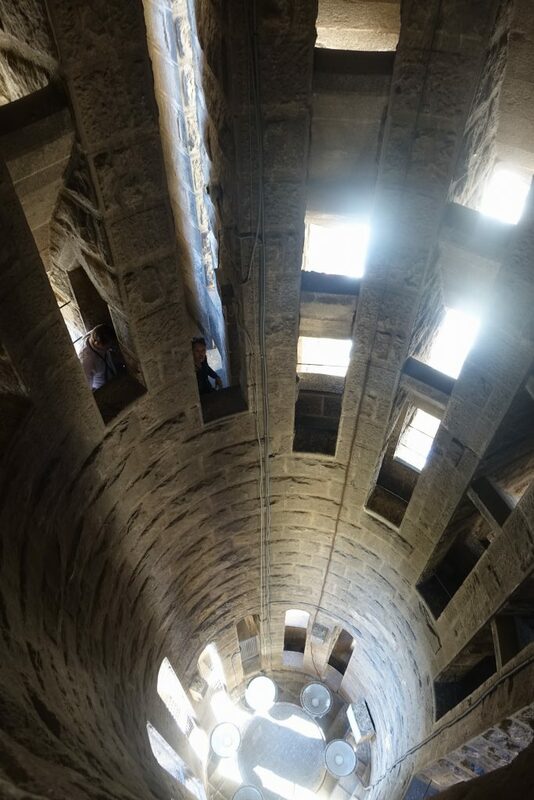 You then get back down to ground level by following a spiral staircase which lets you see right inside one of the towers. On the other side of the tower from the views of the city, you could see the detail in the towers close up – and evidence of the ongoing construction work. Back down on the ground, it was time to explore inside. I’m not religious at all, but it was really pretty amazing and gorgeous really. 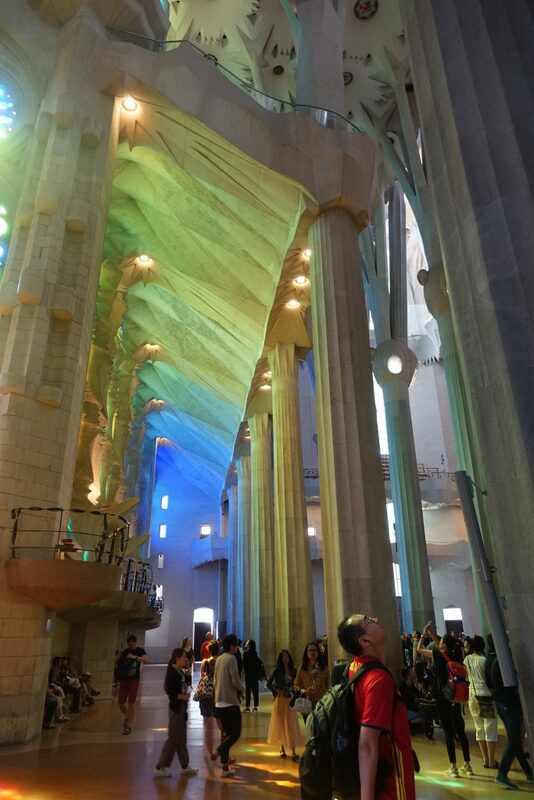 It’s massive for one, but while churches at home are usually dark, this one is filled with light – and colour. Everyone wandering around seemed in awe really. Look at the look on that man’s face! The audio guide was actually pretty good! It explained loads of interesting little details, like the stained glass on one side of the building being in cooler colours as that’s the side of the building the sun rises on. 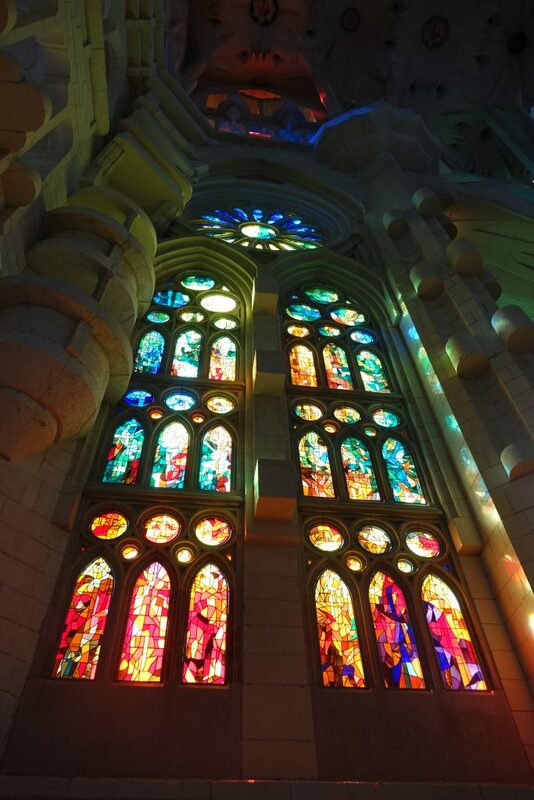 The stained glass was really cool too – modern looking rather than medieval. And pebbles of coloured light spilled on to the ground. It was really pleasant just wandering around. 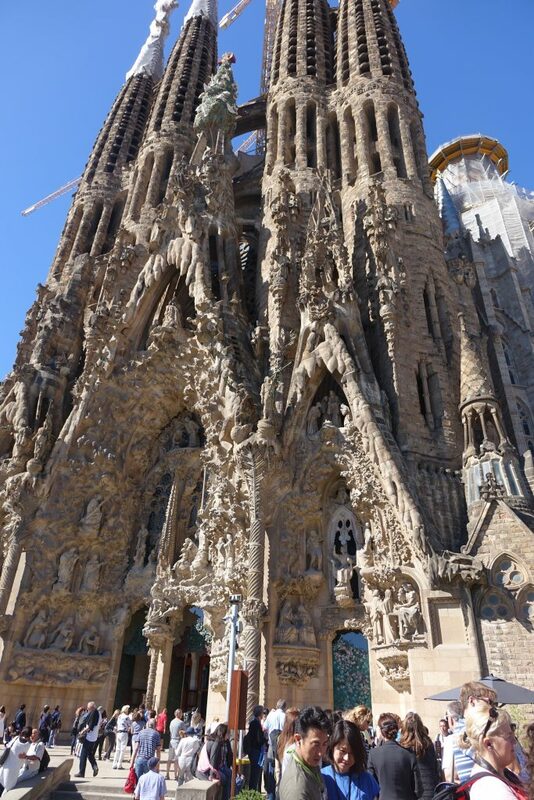 Heading outside to take a closer look at the outside of the church, it was really amazing just to hear about – and see – all the detail that Gaudí had packed in – it was so intricate. Somewhere in there were two turtles – on each side of the entrance. One had flippers as it was on the side nearest the sea, whereas the other was nearest the land side, so had feet. There were loads of little details like that to gaze at. Then I wandered around to the other side of the building. 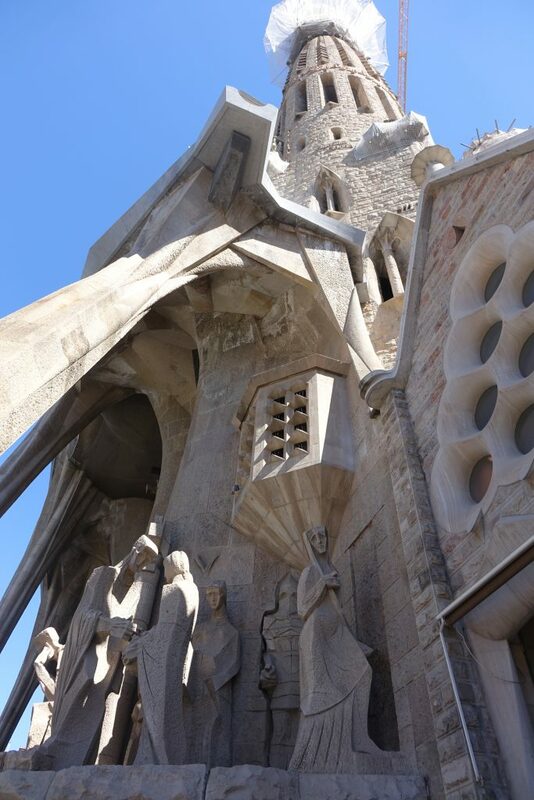 It depicted the crucifixion so was designed to be colder in style…. 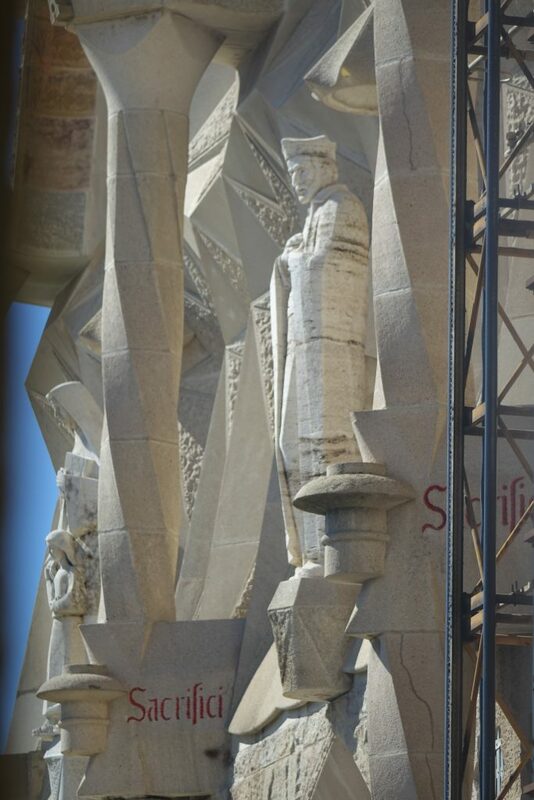 Apparently the soldier’s helmets were designed with the roof of Casa Milà (which I’d visited the other day) in mind. I headed downstairs, where there’s a museum about the construction of the church. 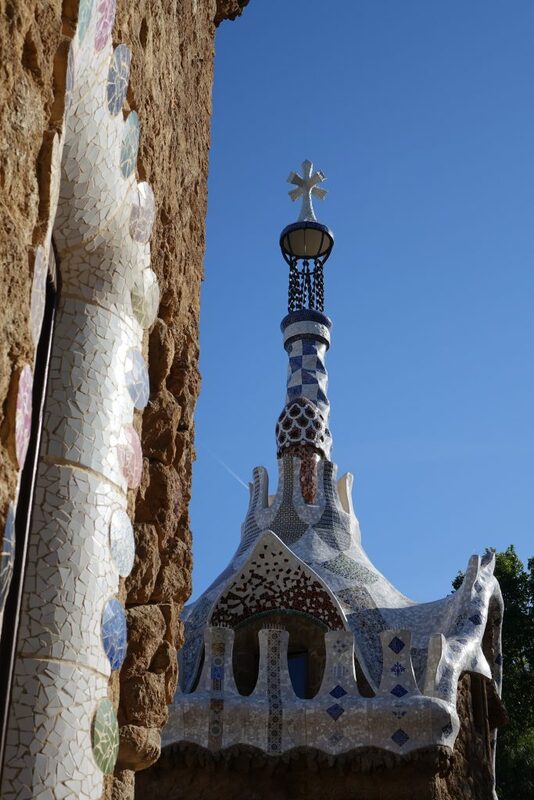 It was sad Gaudí wasn’t around to see how his church developed. He was killed in a street car accident, but had already left plans and everything for trusted people to continue his work. I was really glad I’d visited the church – I think I’d have missed out if I hadn’t bothered going. 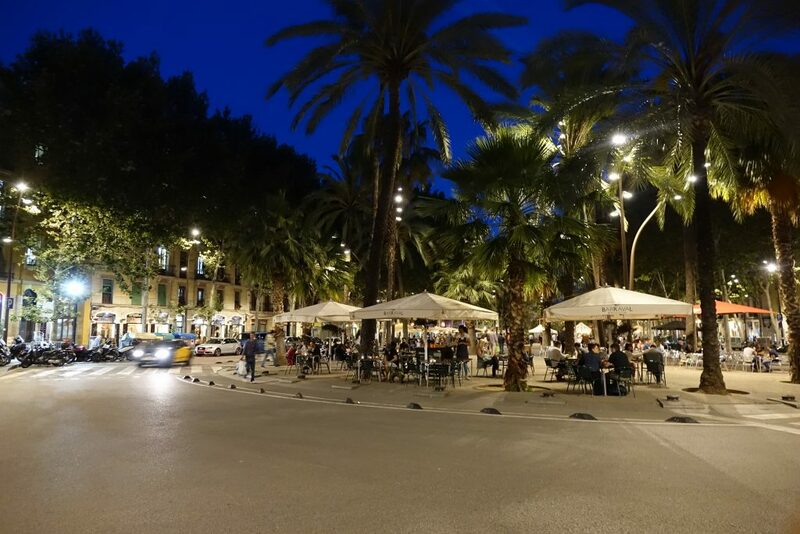 After my visit was over, I jumped back on the metro, and headed to the hotel where I grabbed a coffee and wrote up my blog, then headed out for a late lunch – by now it was about 2.30. 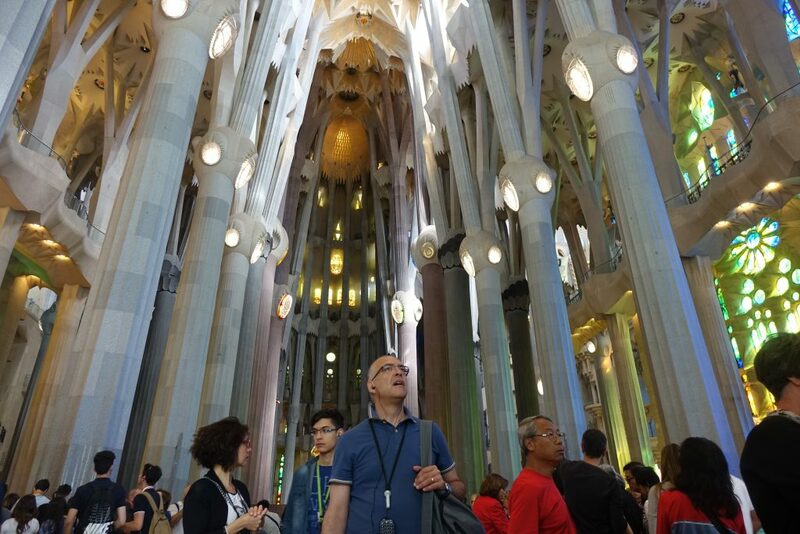 Based on recommendations from Barcelona expert Debbie (thanks Debbie!) 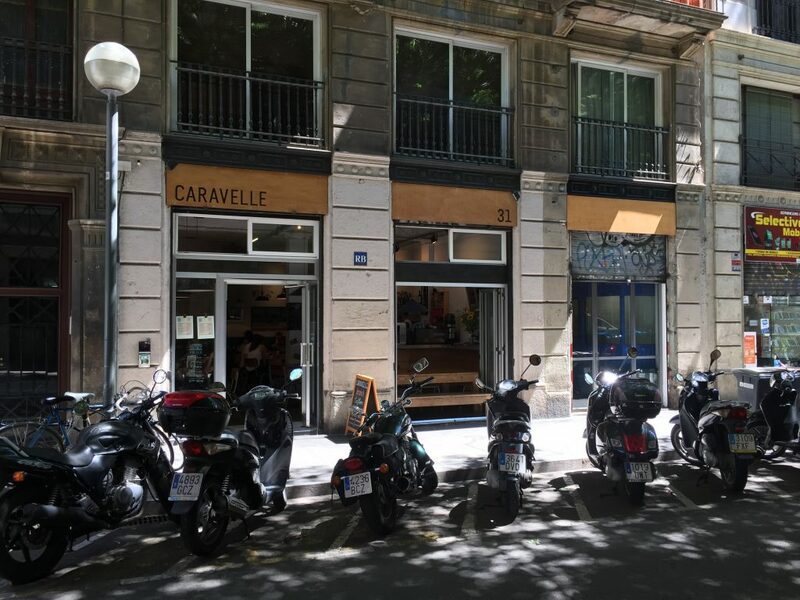 I headed to a spot about a ten minute walk away, called Caravelle. 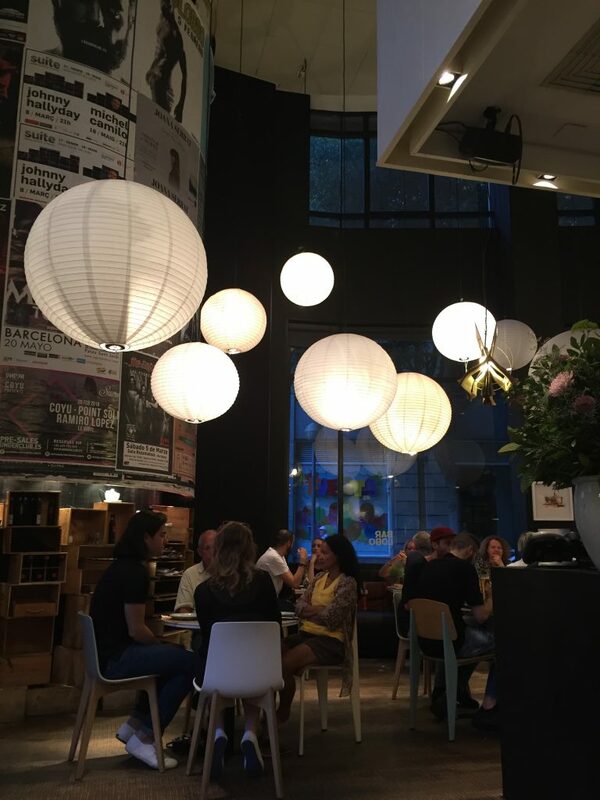 It’s a light, airy place, and reminded me of Bill Granger’s café in Surrey Hills, Sydney – which I love! 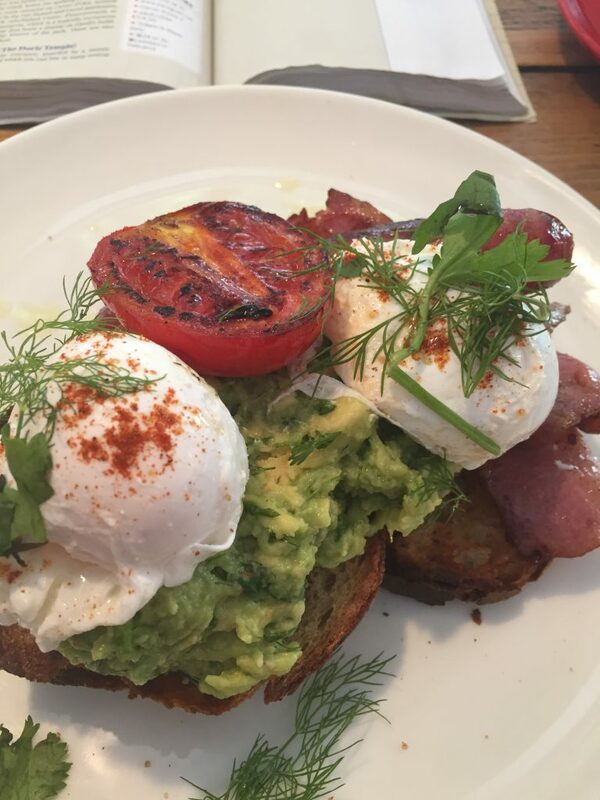 I sat at a communal table, and ordered the Spanglish – smashed avocado on bread with poached eggs, a sausage, and bacon. Look at that! Lovely, and it tasted great too. 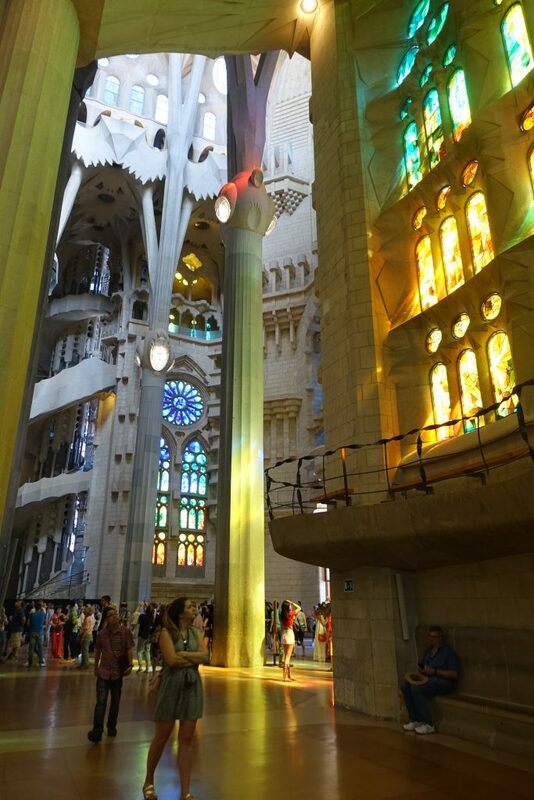 Fully fed, it was time for my second Gaudí experience of the day. 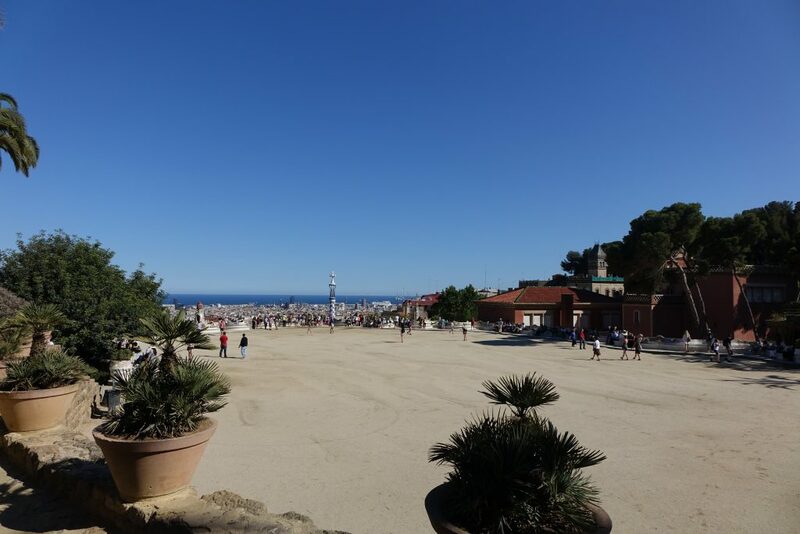 I got back on the metro and headed North to Park Güell. It was a fifteen minute walk from the metro station to the park – apparently there’s an escalator to take you up the hill someplace, but I didn’t find it, and was faced with this instead. That doesn’t look steep, but let me tell you, it was. And there was steps – so many steps. Basically way at the back of that photo are loads of them. With a sigh, I started trekking uphill, and it wasn’t as bad as I thought! Soon I was in the park. I didn’t see anything that didn’t just look like trees and grass though, so consulted a map, and eventually managed to find my way to one of the ticket desks. I’d come in at the back. The way the tickets work is a bit confusing really. Lots of the park is free to walk around, but all the interesting stuff is in the ‘monument area’, and to enter that you need to buy a ticket, which has a time stamped on it. Again you can buy your tickets in advance online, and again I’d recommend it. The sign at the ticket kiosk said the next entry for the ‘monumental area’ was 6.30pm, but I was lucky and got one for in an hour’s time – 6pm. The sun was beating down by now, and I could feel myself beginning to get a bit sunburnt, it was very hot! 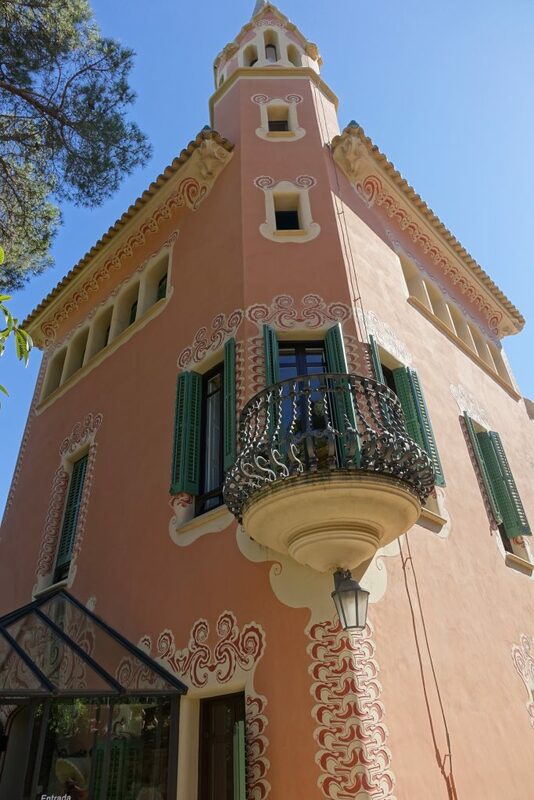 With an hour to kill, I headed into the Gaudí House Museum – a house in the park where Gaudí had lived. You need a separate ticket for that, so I paid the small entrance fee and wandered in. 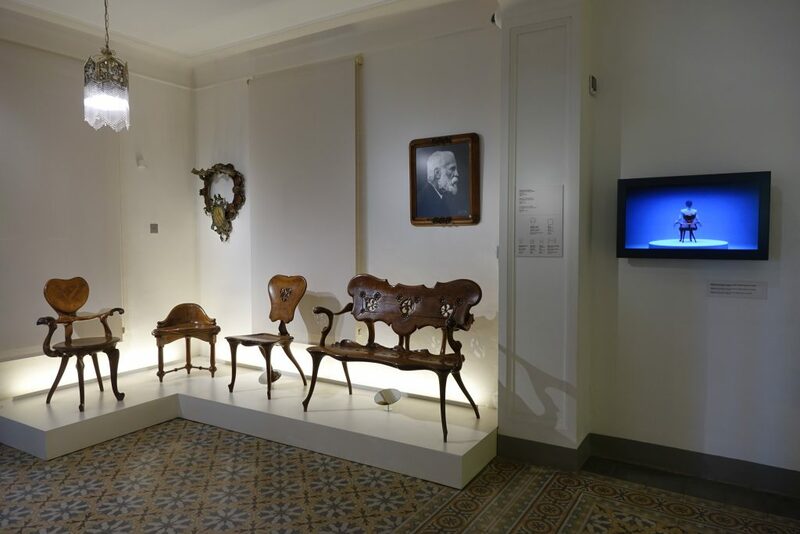 It’s really, really small, and there’s not much to it – it was mostly displays of bits of furniture and so on. By now, 6pm was approaching, so I queued up at the entrance to the monumental area. I’d seen all the photos of multi-coloured tiled walls, and that was what I particularly wanted to see, but I was surprised by how low and small they were! Which makes sense I guess as you want to see the view. There’s only 400 people allowed in the ticketed area every 30 minutes, which was good as it meant it wasn’t too busy, but the wall area was packed with people taking selfies and pushing in to get photos taken. Very rudely in some instances! That’s the best shot I got from the walls. The two buildings in the foreground are former porters’ houses. My second good view of the day! 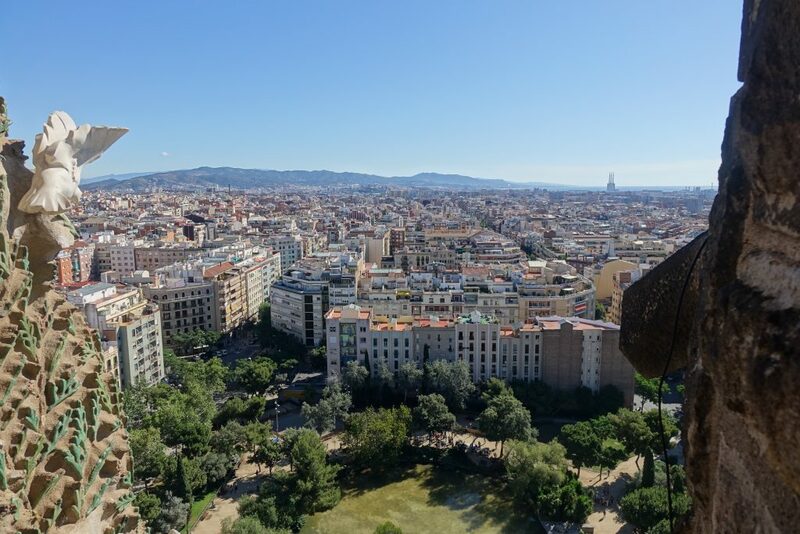 After strolling around the walls for a bit, I headed off to explore the rest of the monumental area – it was fairly compact really so you could do it quickly, but I took my time, getting photos as I went. 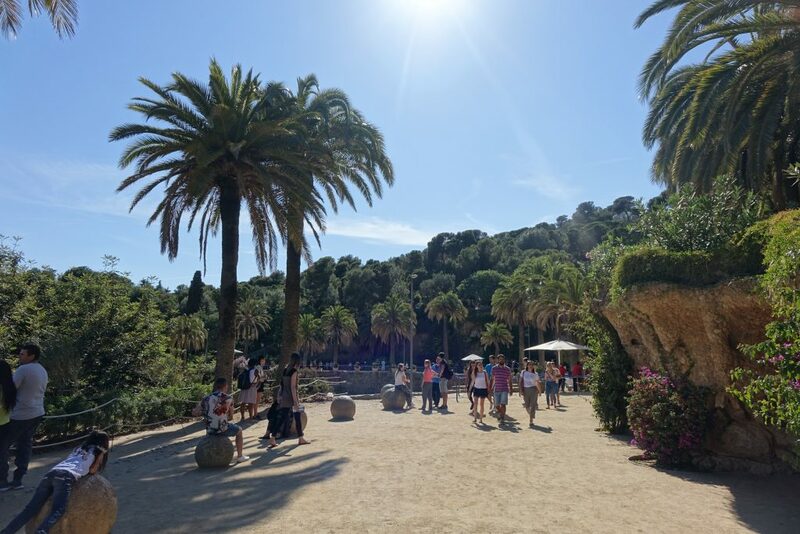 The park was designed by Gaudí for a man who wanted to build a British type estate and have houses on it for the wealthy, but that all went a bit pear-shaped, and wasn’t commercially viable, so it eventually became just a park. I joined a queue to go inside one of the porters’ houses, but by now the sun was feeling incredibly hot. I felt like my head was beginning to melt, and the sign at the queue said there was a 45 minute waiting time from that point. Luckily, it was only like ten minutes, and soon I was inside, but again there wasn’t really that much to see. 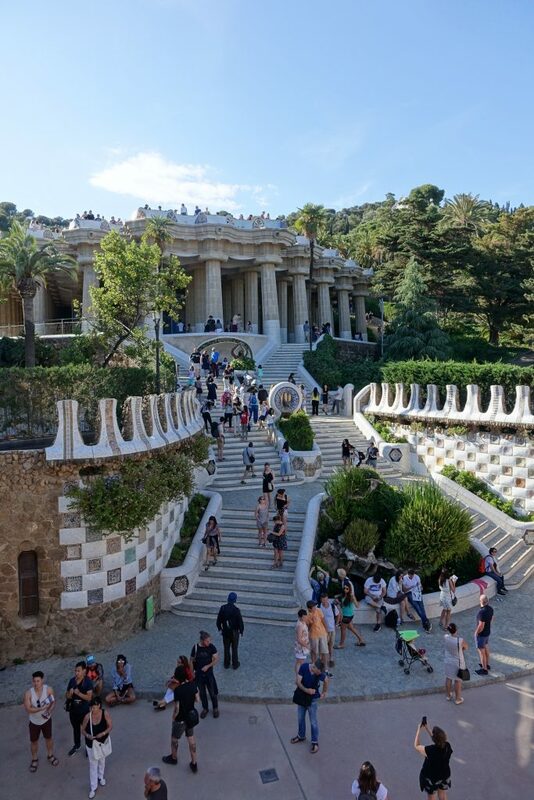 I made my way up a beautiful staircase to a pillared area that, in Gaudí’s time, was planned to hold markets, but that never came to be. Now it appears to be under refurbishment – there were bits of scaffolding about, and nothing else. After about an hour and a half, I decided to head out of the park and back to the hotel. 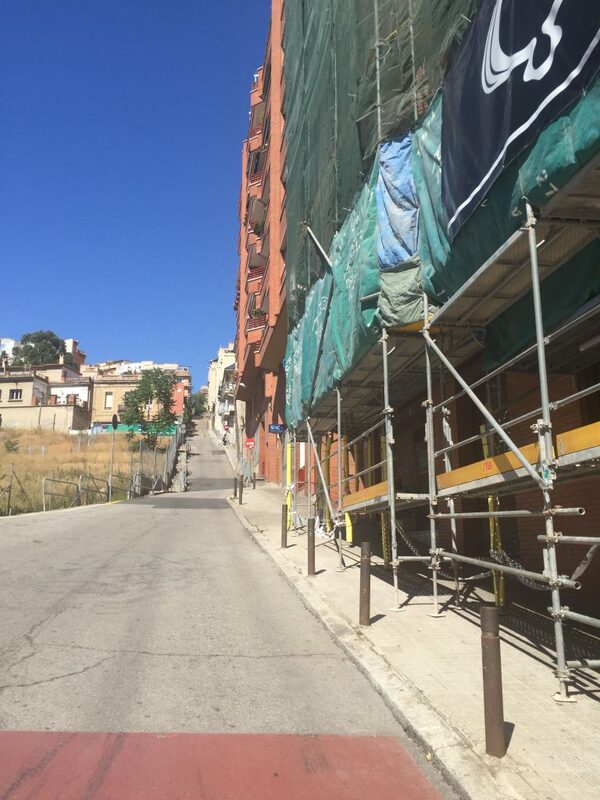 Thankfully it was a downhill walk this time, and I headed to the nearest metro station. 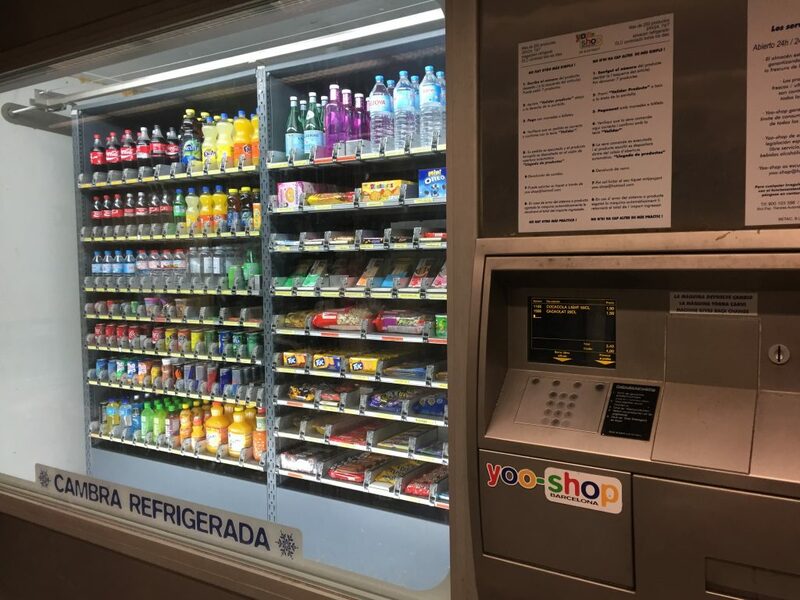 Now I’ve seen some vending machines in my time (especially in Japan) but this one was a BEAST! I got some chocolate milk and a Diet Coke, purely to see how it worked, and was so in awe I walked away forgetting my change. (I did return for it). Arriving back at the hotel, I was pretty knackered, and tempted just to go and get a sandwich to eat in my room, but really I had only eaten out for dinner in McDonald’s so far, so I decided to head out instead. 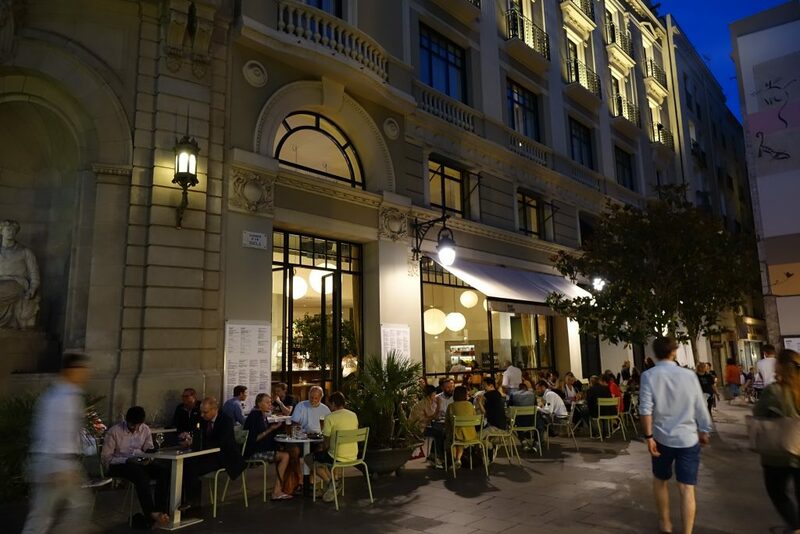 The area I’m staying in – El Raval – is packed with restaurants, apparently some of them pretty good, but most of the ones in my guide book were closed on Sundays. So I hit up Foursquare and checked out local tapas places, and decided on a place called Bar Lobo, about a ten minute walk from my hotel. When I arrived, it was busy, and there was a bit of a wait, so I took that as a good sign! I was hoping for a seat outside, but it wasn’t to be – after about ten minutes, I was seated inside. It was lively, and the soundtrack was good, so I was happy enough! I wanted tapas when I was in town, and there were several on the menu that took my fancy. The waiter said to order two – maybe three if I was really hungry, which was a bit of a surprise to me, as I thought tapas were tiny! I ordered patatas bravas (just wanted to try that in Spain!) and Galician octopus – maybe inspired by my trip to the market. When they arrived, I was glad I’d just ordered two – the portions were waaaaay bigger than I thought! That was just the octopus! 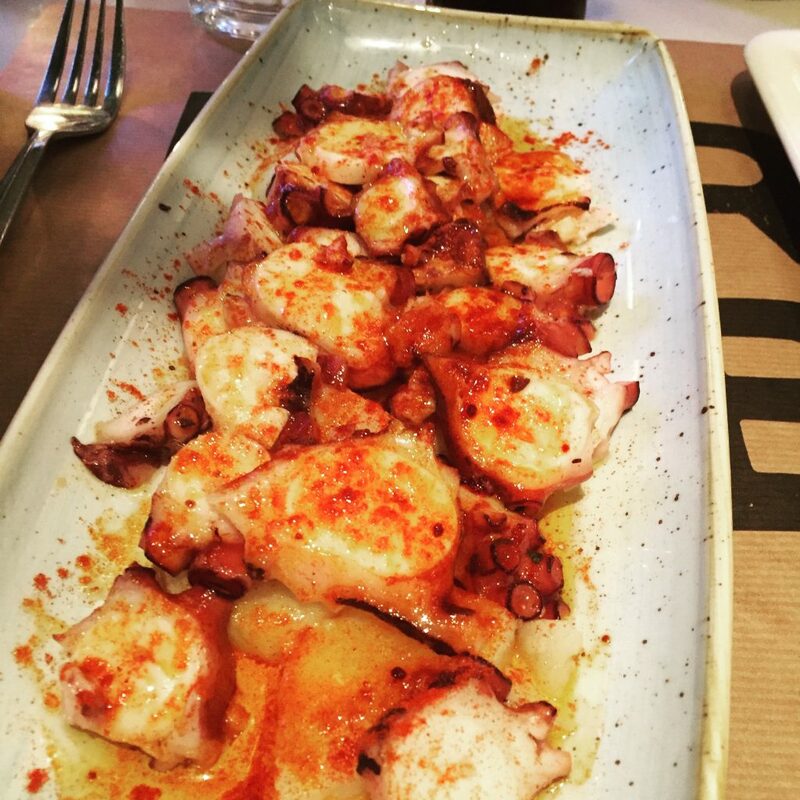 It looks like it has cheese on it, but it didn’t – it was delicate slices of octopus, with a hint of paprika. Very nice, as were the potatoes! I wandered back to the hotel, just soaking up the atmosphere en route. Back at base, I headed up to the roof terrace for a glass of vino before bed, only to find it was totally mobbed with Americans who all seemed to be talking about finance and merchant banking – VERY LOUDLY! So I drank my wine pretty quickly, and turned in for the night. I’d had a really enjoyable day in the sun!